We continue this “ordinary time” in the Season after Pentecost in Year B with readings from the Old Testament stories of God’s Word and will revealed through the anointed leaders of the nation, as told in 1 and 2 Samuel followed by selections from Wisdom literature. We began the “kingly” saga with last week’s reading: the people of Israel cry out for a king as like the other nations. Samuel, with a distaste for this request, delivered a severe lecture on the evils of kingship. Yet, due to the persistence of the people, God allows them to make Saul king of Israel – which led to disastrous results. They had chosen to put their faith in an earthly king rather than in the Lord’s reign over them. 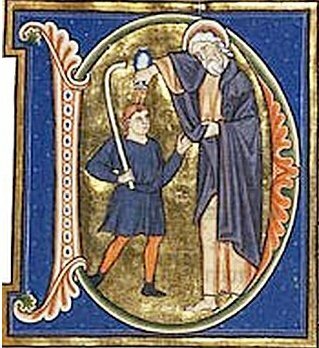 In Old Testament times, anointing involved smearing a person’s head with scented oil as a way of designating the person for a particular office. Today’s passage on the anointing of David to be king of Israel shows the Prophet Samuel acting in faith according to God’s will. King Saul was rejected for disobedience to the Lord (1 Samuel 13:7-14; 15:10-29). And although the Lord’s turning away from Saul brought grief and sorrow, the prophet obeyed the Lord’s command to travel to Bethlehem to anoint a new king from among the sons of Jesse – a king who would be fully obedient to God. Although David had not yet reached maturity, there was in him a potential for leadership perceived by God. Although anointing might occur in many different circumstances, the general meaning tends to be consistent: whatever or whomever is anointed is dedicated to the service of and obedience to God. They are sanctified, which means that they are made spiritually and ritually pure, a necessary condition for the service of God. Today, we are “anointed” or “sealed” with oil (Chrism) at Baptism and marked as Christ’s forever (BCP 308). This entry was posted in Baptism, Ordinary Time and tagged anointing, Baptism, David, Old Testament, Samuel. Bookmark the permalink.